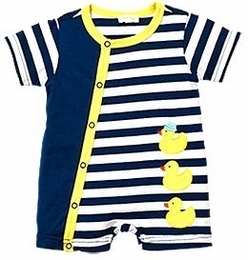 Lucky Duck Striped Romper - Largest Twin Store & Twin Gift Registry! Available in Matching Outfit for Girls! Little ducklings will waddle in style in this sweet romper! This navy and white striped one-piece romper features an asymmetrical front of solid navy with bright yellow trim and snaps. Three adorable duck appliques on the front and a pocket on the back kick up the cuteness factor!